Chill wine to the perfect temperature, and make it easier to pour by using this freezable sleeve. 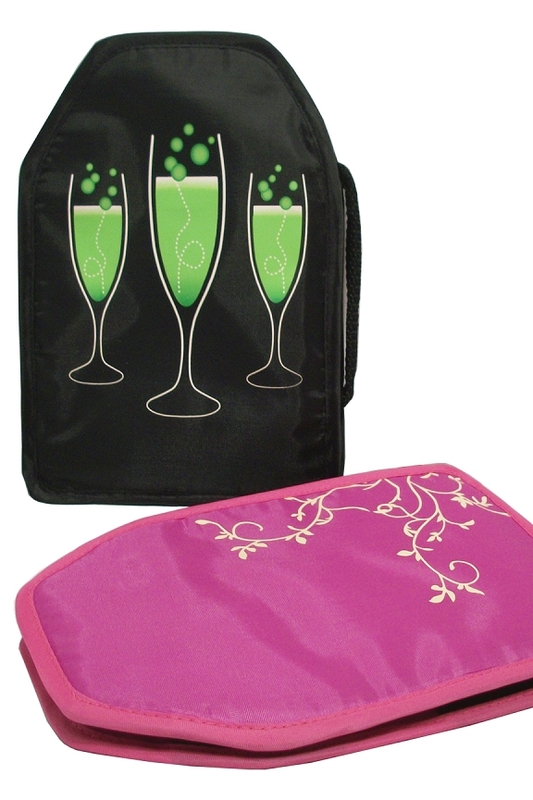 The large pouch is similar to other freezer pack cooling devices, but this one has thick elastic bands to keep it in place around your bottle of wine. An added handle on the side is comfortable to hold, and it allows you to serve wine without touching the bottle. With cooling gel on both sides, and throughout the interior, it surrounds bottles with an ice cold layer that helps to prevent warming, and keep your beverage at the ideal temperature until finished. It's incredibly simple to use, so just toss it in your freezer for at least two hours, then slip it onto any bottle to keep the beverage inside cold for an hour or more. It comes in your choice of two colors, and each one has a fun design printed on the exterior. It's completely washable and reusable, so don't settle for warm wine again. There's no need to take it out when it's time to pour, so hot hands, and swampy air never have to touch the bottle. Ideal for dessert wines and whites, but also useful for other beverages that fit. Use this stylish cooler to make each sip more enjoyable, and impress friends and family members you share with. Want one that maintains temps for even longer? We also have a Cooler Bag that has a freezable internal sleeve and an thick, insulated cover that zippers shut. Looking for something to transport bottle when on the go? Check out our 2 Bottle Tote or Four Bottle Tote. They are insulated to maintain temps and protect against damage, and internal dividers allow you to carry more than one bottle without any clanging glass. Ice Cold. When pulled from your freezer, this pouch will be extremely cold, but it will also remain flexible to conform to the rounded exterior of the bottle. Simple. Incredibly easy to use, just slip the bottle inside after freezing and you'll be good to go. Once secure and in place, use the handle at the side for pouring. Reusable. The nylon material is much more durable than flimsy plastic alternatives, so it will last longer without showing wear. When dirty, just wipe clean and keep on using. Versatile. The large pouch and powerful elastic bands combine to provide a snug fit and ample coverage with any number of bottles. Use with 750 ml or 1.5 L wine bottles. 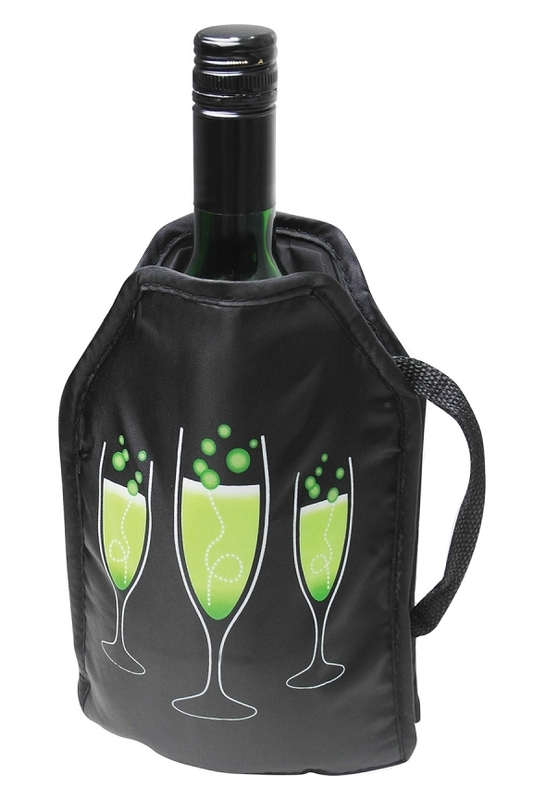 Dimensions 6" x 3" x 9"
Uses Add an ice cold wrap around your wine bottle. Chill the beverage inside and make it easier to serve. An integrated handle makes pouring simple, and allows you to avoid touching the bottle. 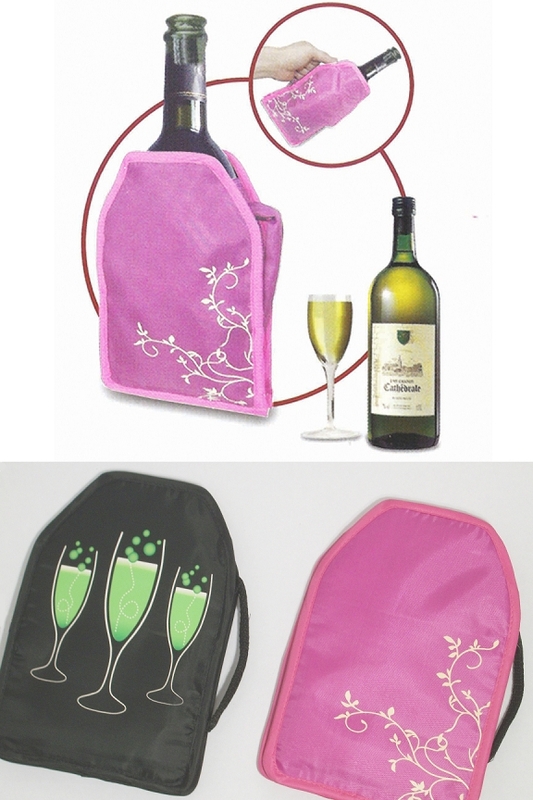 Elastic Size 2" x 2.5" & 3" x 2.5"
Cooling Ability Keep wine cold for an hour or more.